Old HD3+ now becomes the HD4 Hero Silver with a few additions. NEW - integrated Touch LCD screen on the rear. NEW - Front LCD now has record and Wifi lights. Many other features unconfirmed to be announced - Available 15th Oct regional based. $549 available mid oct, lcd on camera, 720/240p and image stabilization...or that's what it says in the reddit thread ! Image stabilisation is not confirmed, haven't listed it or anything else not confirmed else it is just rumour. GoPro Inc on the stock market seem to approve, $81.73 per share as of today closing. @Rambo....just going by what looks like the same source of information you're using. Confirmed ? ...by who exactly ? Unless you're a gopro spokesperson...it's all still rumor , although I certainly hope IS is true, as well as 720/240p. Appears the original rumors about the ambarella chip to me. @kirth, I've seen your links, that's not my source of info, as for confirmation, lets just say some wholesalers and aftermarket product developers already have most of the info already from GoPro. 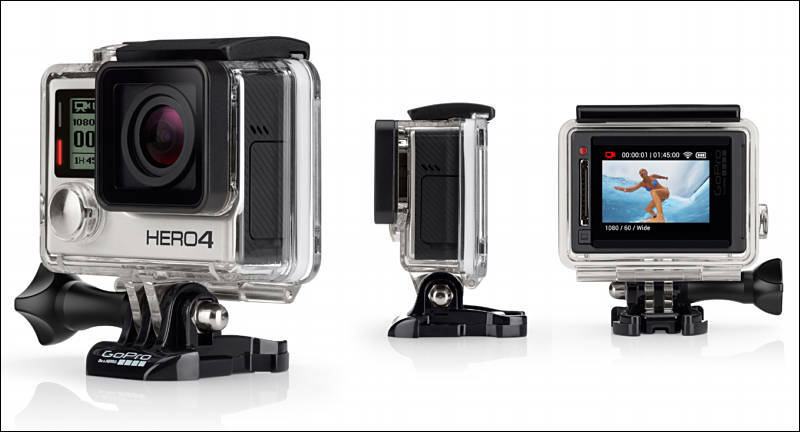 "The rumor mill is abuzz with speculation, but we have the first full scoop on the GoPro HERO4. As many have reported, the two big features that are appearing are 4K video recording at 30FPS and a built-in touch display. Unfortunately, these two features won’t be appearing in the same camera. 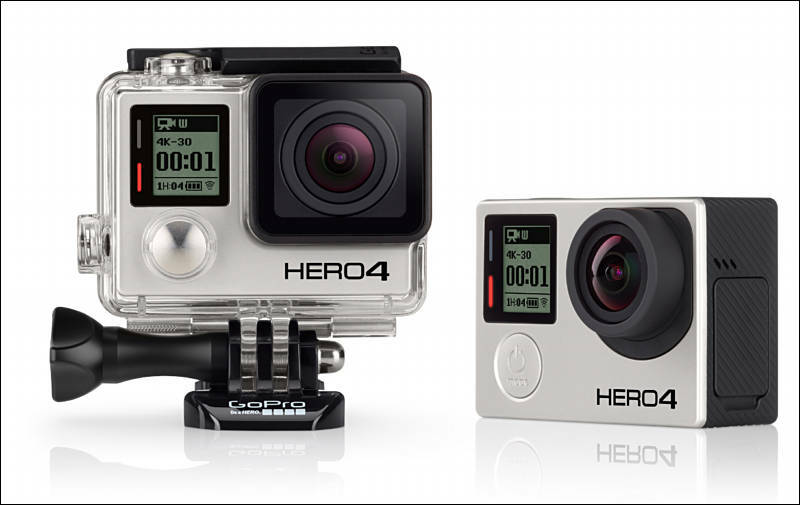 Instead, there will be two models: the HERO4 Black (shown above) and the HERO4 Silver (shown below)." Actually, for such camera, you need ability to change lenses and 4K at 60fps and 120fps recorder in H.265. You also need copter edition without any screens at all (but with good smartphone app). And with special connector making GoPro main controller (so it'll be possible to build very cheap copters). it has improved image quality and a 2x more powerful processor. The Black will capture 4K video at 30 frames per second, up from the 15fps of previous GoPros, allowing for extremely high-quality footage that’s much more usable for a wide variety of applications. Here are the available resolutions and frame rates: 4K at 30fps, 2.7K at 50fps, 1440p at 80fps, 1080p at 120fps, 960p at 120fps, and 720p at 120fps. It appears these cameras are no longer capable of 240fps. For still images, you’ll be able to capture 12 megapixel photos at 30 frames per second. Audio capture is also improved, with the new system capturing 2x the dynamic range. On the front of the camera is an ultra-wide angle glass lens, and the camera can be set to three different field-of-view settings: Ultra Wide, Medium, and Narrow. There will be new manual settings for both photography and videography — controls such as color, ISO limit, exposure, and more. The camera is waterproof down to 131 feet (40m). Other features include built-in Wi-Fi, Bluetooth, exposure settings for nighttime shooting, a “HiLight Tag” feature for marking key moments in footage, a QuikCapture feature for powering up and recording with one button press, and auto low light features. On the video side, the Silver will be able to capture 4K at 15fps, 2.7K at 30fps, 1440p at 48fps, 1080p at 60fps, 960p at 100fps, and 720p at 120fps. For still photography, the Silver will match the Black with 12 megapixel photos at 30 frames per second. The other features (e.g. Wi-Fi, Bluetooth, HiLight Tag, QuikCapture, waterproofing) are pretty much the same as the HERO4 Black. I instantly knew that they'll announce Hero 4, as soon as I bought Hero 3+ Black for my copter. no 720/240p ...no touchscreen on the black ? If they offer the silver for the same price as the black3+, it'll be the winner . A touchscreen is far more useful than 4k/30p. I hope they have manual exp control on all models. I have the touchscreen for the current 3+ and never use it. Tried to on several occasions. Using my phone works way better when there's a need for more control. I think the 4k will be interesting to try again now that it's a usable framerate. I'm most curious about the nightlapse function though. This could be a great alternative to lugging around a big DSLR in certain situations when capturing the stars. Plus, I wouldn't need to worry about it as much if rain moves in. BTW - if anyone wants a deal my LCD touchscreen for a 3 or 3+, let me know. It's currently sitting on a shelf. While the GoPro HERO4 Black and Silver editions feature 4K/30 video and a touch display, respectively, the HERO will be a low-end camera that doesn’t offer either of those features (nor will it have wireless connectivity through Wi-Fi or Bluetooth). Instead, it offers high-quality 1080p30 and 720p60 video capture with some of the other new HERO4 sprinkled in (video will be limited to those two resolutions and frame rates). The QuikCapture feature allows you to power on the camera and begin recording with a single press of a button, allowing you to react to situations and capture them without having to fumble around with your camera. A Burst Photo feature snaps 5 megapixel still frames at a rate of 5 shots per second. There’s also a 0.5 second Time Lapse feature. The rugged housing that comes with the camera allows it to be waterproof down to 131 feet (40m). This housing is integrated with the camera and cannot be removed, meaning the camera isn’t compatible with certain accessories (e.g. The Frame and the LCD Touch BacPac). There’s an Auto Low Light mode that automatically adjusts the camera’s frame rates when you’re in low-light situations in order to optimize performance. Other features include a built-in microphone, microSD card support of up to 32GB, a 2.5-hour battery, and a 3.9oz body. Thanks, that is official release date? Nothing's official VK, but most of these quality leaks have been "controlled leaks" from GoPro themselves, they have done this in the past. The HD4 beta firmware and logs were not meant to be for public though obviously, that was just GoPros slack internal sharing process between those working on it. Do they plan to release new firmware for Black 3+ ? Possibly VK, there are a few bugs that need fixing, but it won't get any new features. Btw, all this Silver and Black is getting old. All they need is one camera model, really. Haha, I think they do need to cover the market though VK, models from $100 for basic and $500 for Pro use, all other regular camera manufacturers do it why not GoPro. What's interesting is the brand and what other devices they decide to take on and apply their marketing strategy to, they've become experts at "connecting" with their customers. I think they do need to cover the market though VK, models from $100 for basic and $500 for Pro use, all other regular camera manufacturers do it why not GoPro. All this market cover is good, but for such product it just means making intentionally inferior products. All they need is simple single camera with 4K60, full size SDHC and ability to change lenses, without any front or rear screen (buy one that magnetically snaps if you like). With basic lens and without anything else it must be $149. I don't get it. I seriously thought that once we had good wireless monitoring via a phone or tablet that we would never see the built in LCD screen again. I honestly would never ever use the LCD screen. In addition I certainly wouldn't want it to have a touch screen that can stop the recording or change the settings on accident. Doesn't this also mean that you can no longer change the battery without completely removing the GoPro from all of its housing because the battery is on the bottom? Basically you can't tripod or hot shoe mount the GoPro anymore. That just kills it for me. Honestly 2.7K @ 30 FPS looked a lot like 4K especially on 2.7K monitors or less. Why would I want to pay more for a whole lot less? Even the 120 FPS 1080p won't be useful in dimmer light unless they have put a faster aperture lens on it. I just don't see anything positive about this release for my needs. Other sources claim October 8 as official release date.